Granger Construction has managed a variety of MRI Suite Construction, Renovation and Equipment Replacement projects for healthcare clients. These types of complex projects all face a number of issues that require careful consideration and meticulous planning to ensure all aspects of the project are completed successfully. Construction of a new suite, completed in four months, to house a permanent magnetic resonance imaging (MRI) machine to improve the quality of care and the overall patient experience. The project involved the removal of the existing concrete floor and replacing it with a 24-inch deep seismic isolation base for the new 6-ton Siemens MRI machine, installing all new MEP systems for the MRI and adjacent support spaces, patient transfer lift systems, metal detection systems and architectural finishes. The project involved the total renovation of the MRI room, equipment room and outdoor mechanical areas. 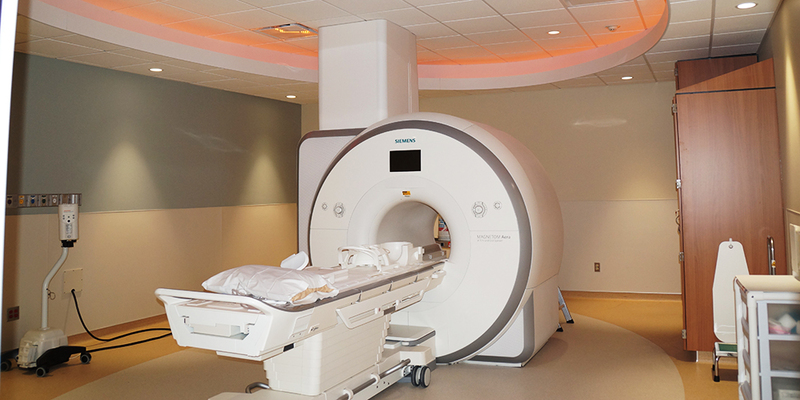 Granger oversaw and coordinated the installation of the GE Healthcare Optima MR450w GEM 1.5T MRI machine, which is considered among the most advanced technologies of its kind. The project also included installation of a custom LED backlight ceiling mural, wall murals, custom casework with LED toe kick lighting and rework of RF shielding, as well as the decommissioning and removal of the old MRI and mechanical equipment. This design-build project was completed on-time in just six weeks and within budget. It is only through careful up-front planning and consideration during every stage of construction that a specialty project such as an MRI suite can be completed safely and successfully.